A summary of Tricolored Blackbird natural history, efforts to conserve the species, and its legal status. Tricolored blackbirds look very much like the abundant and widespread red-winged blackbird (Agelaius phoeniceus), to which they are closely related. The plumage of adult male tricolors is glossy black and may sometimes show an iridescent blue-green sheen in bright sunlight. Adult females are brown dorsally and have brown streaks on their breasts that merge into a dark brown belly, unlike the belly of female red-winged which is streaked. Females may or may not have a brightly-colored epaulet. Juveniles are similar to females but paler (Pyle 1997). After-hatch year (1 year old) males are dark brown, not black, and have orange, not red, epaulets. Adult male epaulets are typically scarlet red, unlike the epaulet of the male red-wing which is orange-red. The band below the epaulet is bright white, not yellow or buffy as in the red-winged blackbird. Breeding males average 65-68 grams and breeding females average 40-45 grams. Total body length is 18-24 cm. The bills of both sexes are long, narrow, round, and pointed (Beedy and Hamilton 1999). Both sexes have narrow, pointed wings with primary 9 longer than primary 6 (Mailliard 1910, Pyle 1997), giving the bird a flight profile that has more pointed wings than does the red-winged blackbird. These different flight profiles can readily be seen by experienced observers (Mailliard 1910, Orians 1961). Flight typically undulating, with powered down-strokes followed by upward glides. Foraging birds fly out from and return to the breeding colony head-to-tail, "follow the leader", and form long flightlines that may persist and allow the birds to be seen at relatively great distances. Foraging flocks appear to roll across the landscape as birds in the rear of foraging flocks fly up to the front. Foraging flocks may consist of hundreds or, in rare cases, even thousands of birds and be seen from some distance. Males may be highly vocal, females silent except when disturbed, when they may shriek in brief, high-pitched single notes. Males may be silent in flight but when leaving breeding colonies may respond en masse to a conspicuous high-pitched, unmusical call as they depart. Occasionally males produce a distinctive "wuk" call (Collier 1968). During settlement and early incubation, males typically utter a strange, cat-like mewing call that is very unlike the sounds produced by other blackbirds. Males sing while courting females, and in larger colonies this produces a very loud song chorus that may be heard at least a kilometer away. There are no identified subspecies, although the tricolored blackbird has two fairly distinct population segments: a Southern California population that occurs in southern California south of the Tehachapi Mountains and into northern Baja California, and a Central Valley population segment that occurs throughout the Central Valley. Banding studies involving in excess of 80,000 birds have documented a very small rate of movement of individuals between these population segments, with a total (in early 2018) of only 5 birds known to have moved from one population segment to the other. Formerly abundant both in coastal California, where it was considered the most abundant bird from Los Angeles to San Diego in the mid-19th Century (Cooper cited in Baird and Cooper 1859), and in the Central Valley of California through interior southern California to northern Baja California (Grinnell 1915). Reported to breed in small numbers in southern Oregon (Neff 1937). Since 1980, breeding has occurred in 46 California counties (Beedy and Hamilton 1999), although the species has essentially been extirpated as a breeder in coastal locations (Kelsey 2008, Meese 2017) and persists in very small numbers (12,000 in 2017; Meese 2017) at widely scattered sites in southern California (Unitt 2004). Gaps also occur in the breeding distribution in the Central Valley (e.g., Meese 2017). Small colonies of tens of individuals persist in northern Baja California (Erickson et al. 2007, 2008, Erickson in Meese 2017), a single colony of fewer than 30 individuals breeds in western Nevada (Ammon and Woods 2006), formerly up to two thousand birds breed at several scattered sites in Oregon (Marshall et al. 2003), and since 1998 a few tens of birds have bred in a few locations near Walla Walla, Washington (Wahl et al. 2005). Resident in Washington, Oregon and Baja California, absent in Nevada. May occur in small numbers along coastal regions and portions of northern California outside of the Central Valley. Wintering populations concentrate in the Sacramento-San Joaquin Delta and formerly along the central coast in Monterey, Marin, and Sonoma counties, where they occur in multispecies flocks with other blackbirds, brown-headed cowbirds, and European starlings (Beedy and Hamilton 1999). Wintering tricolors are associated with open rangeland in the Sacramento-San Joaquin Delta and with dairies along the central California Coast. From mid-October to February flocks to 25,000 frequented dairies on the outer Point Reyes Peninsula in Marin County (Beedy and Hamilton 1999), but few birds (< 1,000) have been seen during winter there since 2012 (Evens, pers. obs., Meese, pers. obs.). A wintering population estimated at 50,000 birds was observed by Ted Beedy and Bob Meese outside Birds Landing, Solano County in late October, 2007 but only 4,000 birds were observed wintering in the same location in winter 2017/2018 (Meese, pers. obs.). The precise locations of and habitats utilized by wintering tricolors are poorly known and there is great need for extensive study of the distribution and abundance of this species throughout the winter. Often described as nonterritorial, but both males and females maintain breeding territories held for the duration of a single nesting effort. Territories include only nesting space, not foraging areas, and range in size from less than one to several square meters, with most territories between 2 and 6 square meters (Beedy and Hamilton 1999). In some instances, especially in especially high nest densities, tricolor territories may be vertically stacked (e.g., Hamilton and Meese 2005). In contrast, the closely-related red-winged blackbird is highly territorial and during the breeding season males defend territories that include two to several females as well as some foraging habitat. Thus, red-winged blackbirds are quite sparsely distributed across the landscape during the breeding season while tricolored blackbirds tend to form large, dense colonies during the breeding season and it is this difference in behavior that most clearly distinguishes the two species for most people. Males may arrive on the breeding sites 1-3 days before the females, typically in mid-to-late March in southern California and the San Joaquin Valley (DeHaven 1975b) although the onset of breeding has occurred as early as late February since 2014 and has been shown to be advancing (Holyoak et al., unpub.). The tricolor typically nests twice, and the second breeding attempt often occurs in a different, more northerly location (Hamilton 1998) for Central Valley breeders, although when breeding conditions permit, second breeding attempts may occur in the same or immediately adjacent locations (Meese 2006, 2007, 2008). Comparable movements have not been reported in southern California, where the species is believed to be resident. In most cases, one male breeds with two females in each breeding attempt. Pair bond persistence from for one breeding attempt to another has not been studied. Tricolors may be site-faithful, and if landscape conditions permit, will return to breed in the same locations year after year (Meese, unpub. data), but much within-year between-colony movement has been documented (Wilson, Meese, and Wyckoff, 2016, Meese, unpub.). The tricolor builds its nests on a variety of substrates, although most of these are either flooded or armored. Historically, most colonies were established in freshwater marshes dominated by cattails (Typha spp.) and bulrushes (Scirpus or Schoenoplectus spp. ), with willows (Salix spp.) and nettles (Urtica spp.) also common (Neff 1937). The introduced mustards (Brassica spp. ), Himalayan blackberry (Rubus armeniacus), thistles (Circium spp. ), and cheeseweed mallow (Malva parviflora) have been commonly used for several decades. Since the 1980's, the largest colonies have typically formed in grain (almost exclusively triticale, a hearty wheat x rye hybrid) fields in the San Joaquin Valley, especially so-called "dirty fields" that have relatively large amounts of invasive mustards or mallows. The tricolor builds an open cup nest out of long leaves of a variety of plants. In most cases, the leaves are collected dry, then taken to a nearby water source, placed in the water for several seconds until thoroughly wet, and then taken to the nest site (Meese, pers. obs.). The leaves are woven around stout, upright stems of many plant species, at heights of only a few cm to 2 meters above ground or water level, with ca. 1 meter being typical. The female builds the nest alone, with males only very rarely providing nest materials to the females. Nest-building takes about 3 days. Coarse materials are woven around the stems to produce a platform, then similar materials are used to create the sides, a mud bottom is added, and when this dries, very fine materials are placed on top of the mud to provide a soft substrate for the eggs. Typically, four eggs are laid, with 3-egg clutches also common (the most common number for second clutches in a season), and 5-egg clutches rare. The eggs are oval, typically light blue but occasionally light green, with dark reddish-brown splotches concentrated on the blunt end. Egg length averages 24-25 mm, and egg weight averages 2.5-5 grams. Egg laying typically begins the day after nest completion, and one egg is laid per day (Beedy and Hamilton 1999). Incubation of eggs is exclusively by the females and begins with the laying of the first egg (Beedy and Hamilton 1999). Eggs are incubated for approximately 12 days, exceptionally to 14 days (Payne 1969). The young are born naked and blind. Young weigh 2-3 grams at birth (Beedy and Hamilton 1999). Nestlings typically fed for 11-12 days; feeding by both parents. Young fed almost exclusively animal prey from birth until day 9, after which a mixture of both plant and animal foods are provided (Crase and DeHaven 1977; Skorupa, Hothem, and DeHaven 1980; Meese pers. obs.). Tricolors are brood-reducers, meaning that the females remove "surplus" newly-hatched eggs and young from nests in environmental conditions which they assess to be insufficient to enable them to find enough insect food to rear all of the young from the eggs that hatch. Carcasses of these discarded young can sometimes be quite conspicuous and easily found around the perimeters of nesting substrates. 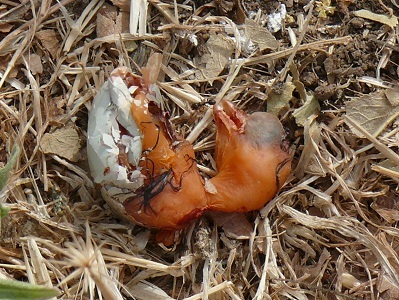 Carcass of brood-reduced young not yet fully hatched from egg. Young typically fledge at day 10-14. Fledglings remain in or on periphery of colony for several days post-fledging, actively and quite vocally soliciting food from adults. Both parents feed fledglings. In many cases, adults lead fledglings away from the colony by returning to the fledgling with food, but instead of feeding the fledgling, fly away from the colony with the fledgling in pursuit. Adult female and fledgling. Sue Liberto photo. Tricolored blackbirds, like other blackbird species, are fundamentally granivores (Orians 1980); however, tricolors consume a wide variety of plant and animal foods (Skorupa, Hothem, and DeHaven 1980), and respond opportunistically to the most abundant, readily available food resource (Payne 1969, Meese 2013). In the San Joaquin Valley, most tricolors feed on stored grains associated with dairies, with additional animal foods taken from both aquatic and terrestrial habitats up to 9 km from the colony. Birds may forage over a wide area, but females forming eggs and adults feeding nestlings typically concentrate foraging efforts on small, highly productive habitats, including shrublands (often excellent sources of caterpillars), pasturelands (many types of insects, but especially grasshoppers during grasshopper "breakout" years), wetlands (aquatic insect larvae), and rice paddies (aquatic insect larvae). Exposure to severe weather can cause massive mortality to adult females, eggs, and nestlings (Beedy and Hamilton 1999, Meese pers. obs.). Intense rainfall and strong winds are the two primary weather-related mortality sources, but colony desertion may occur after day 3 of a mid-summer heat wave where daytime temperatures exceed 38C (100F) for three or more days in a row (Meese, pers. obs.). The tricolor has a large number of predators, and predation has been implicated in colony desertion (Beedy and Hayworth 1992, Hamilton 1998, Hamilton and Meese 2005). The most serious tricolor predators are black-crowned night herons (Nycticorax nycticorax) and white-faced ibises (Plegadis chihi) and raccoons (Procyon lotor) in wetland colonies and coyotes (Canis latrans) and cattle egrets (Bubulcus ibis; Meese 2011) in upland and triticale colonies. Additional predators include northern harriers (Circus cyaneus), northern ravens (Corvus corax), Cooper's hawks (Accipiter cooperii; Beedy and Hamilton 1999), and California king snakes (Lampropeltis getula). Demographic information is only now becoming available as until recently relatively few banded birds have been recovered to make generalizations. Work by Neff (1942) and DeHaven and Neff (1973) suggests a maximum lifespan of at least 12 years, while Kennard (1975) suggests a 13 year lifespan. These are most likely to maxima for males, as they are about 50% larger than females and likely live longer. Band returns analyzed by Meese (unpub. data) suggest an average annual adult survivorship of 60%. Females are believed to breed at one year while males are believed to defer breeding until their second year (Orians 1961; Payne 1969). The tricolored blackbird has been the subject of intensive study for several decades due to observed declines and absences from portions of their range, and the Tricolored Blackbird Working Group produced a Conservation Plan in 2007 to guide conservation efforts. The original, pre-Columbian abundance of the tricolored blackbird is unknown and likely unknowable. The tricolor was described as the most abundant bird species in coastal southern California, in the region from Santa Barbara through San Diego, at the end of the 19th Century (Cooper in Baird and Cooper 1859, Unitt 2004). The first intensive studies dedicated to estimating tricolored blackbird abundance began in the 1930's in response to criticism of the Bureau of Biological Survey (the forerunner of the U.S. Fish & Wildlife Service) for failure to respond to perceived widespread reductions in abundance prior to 1931 (Neff 1937). Neff conducted six years of field work across large portions of the species' range, from the northern Sacramento Valley to southern California, and his abundance estimates were derived from counts of nests during or following the breeding season. Neff (1937) and his assistants studied breeding tricolored blackbirds and found single colonies consisting of up to 282,000 nests, with a maximum number 491,000 nests from a sample of 8 colonies in 1934. Extrapolating from Neff's estimates, one may conservatively estimate the number of tricolored blackbirds as in the range of 2-3 million birds in the 1930's. DeHaven and colleagues looked at the abundance of tricolors in the early 1970s and concluded that the species had declined by at least 50% in the 35 years since Neff's work. Subsequent field workers tried to estimate the statewide population of tricolors via a volunteer-based survey originally conceived and coordinated by Ted Beedy and Bill Hamilton. 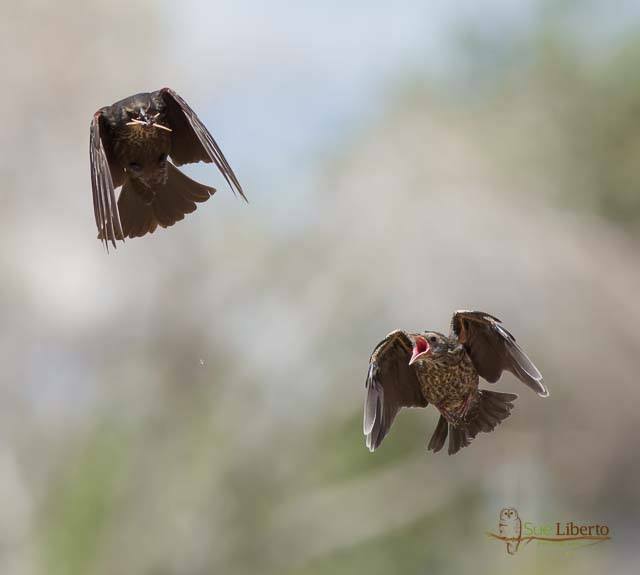 These so-called Tricolored Blackbird Statewide Surveys attempted to detect and estimate the sizes of all colonies across the entire state during a 3-day interval in April, when the birds are most reliably counted. These statewide surveys began in 1994 and from 1994 to 2005 produced estimates of numbers of tricolors in the range of 250,000 birds (i.e. fewer birds than had been estimated from a single colony by Neff in the 1930's). There was much variation in the level of effort and in geographic completeness among the 1994-2005 Statewide Surveys, however, and trying to deduce a population trend by comparing the results of these surveys is difficult. The 2008 triennial Statewide Survey, which differed from previous Statewide Surveys by having 1) county coordinators, 2) data management, and 3) data entry via this Tricolored Blackbird Portal, estimated the statewide population at approximately 400,000 birds. The 2011 Statewide Survey estimated that only 258,000 birds remained, the 2014 the statewide population estimate was only 145,000 birds, but the 2017 statewide population estimate went up to 177,600 birds (Meese, 2017). Taken together, these factors have reduced the available breeding and foraging habitats by transforming the landscapes in which the birds evolved, and reduced the numbers of adults by shooting and poisoning during and following the breeding season. Although deliberate shooting and poisoning were prohibited in the 1970's and 1980's, habitat losses continue. harvest of the grain fields used as nesting substrate while eggs or young are still in the nests; this causes catastrophic failure of entire breeding efforts that often affect tens of thousands of birds. This video was filmed in Merced County in 2006 and shows the destruction of a Tricolored Blackbird colony during the harvest of a grain field. conservation of the largest "silage colony" (i.e. 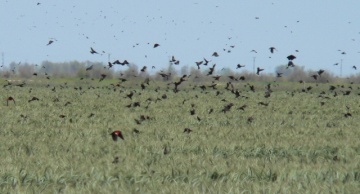 nesting colony established in a triticale field in the San Joaquin Valley) through voluntary sale by the landowner and purchase by the state or federal government or non-governmental organization; a process known as a "silage buy-out"
The tricolored blackbird is federally protected under the Migratory Bird Treaty Act, or MBTA (https://www.fws.gov/migratorybirds/RegulationsPolicies/mbta/mbtintro.html). Formerly, the tricolored blackbird was exempt from the protections offered to many North American birds by the Migratory Bird Treaty Act, as most blackbirds and relatives ("yellow-headed red-winged, rusty, and Brewer's blackbirds, cowbirds, all grackles, crows, and magpies") are considered potential agricultural pests and exceptions to protection under the MBTA are possible in cases where birds are about to cause depredations "to ornamental or shade trees, agricultural crops, livestock, or wildlife, or when concentrated in such numbers and manner as to constitute a health hazard or other nuisance" (50 CFR 21.43). However, in 1985, the tricolored blackbird was removed from the list of exempted species and now is fully protected under the MBTA (50 CFR Part 10 13708). Currently, the tricolored blackbird is considered a Species of Conservation Concern (http://www.fws.gov/migratorybirds/reports/BCC2002.pdf). As of February 2018, the species' status is under formal review after a 90 day finding in 2015 that formal listing on the Endangered Species Act may be warranted. A recommendation based upon this status review is expected in August, 2018. The tricolored blackbird was given emergency Endangered status under the California Endangered Species Act in December, 2014. This listing provided temporary (6 month) protection but was allowed to expire in June, 2015. The California Fish and Game Commission voted to list the tricolored blackbird as Threatened under CESA at its April 19, 2018 meeting in Ventura. See the list of State and Federally Listed Endangered and Threatened Animals of California at: http://www.dfg.ca.gov/biogeodata/cnddb/pdfs/TEAnimals.pdf. The Bureau of Land Management designates the tricolored blackbird a Sensitive Species (BLM 2003; http://www.blm.gov/nhp/efoia/nv/ib/2003/nvib2003-097a.pdf). Not a regulatory agency, the World Conservation Union, or IUCN (http://www.iucn.org/), maintains lists of threatened and endangered species world-wide. The tricolored blackbird was placed on the IUCN Red List as Endangered in 2006 (http://www.iucnredlist.org/details/22724196/0). [Anonymous]. 2016. Sample Survey, 2016 (unpublished). [Anonymous]. 2015. Sample Survey, 2015 (unpublished). [Anonymous]. 2014. Statewide Survey, 2014 (unpublished). Ohlendorf, HM, Hoffman DJ, Saiki MK, Aldrich TW. 1986. Embryonic mortality and abnormalities of aquatic birds.. Science of the Total Environment. 52:49-63. Ammon, EA, Woods J. 2008. Status of Tricolored Blackbirds in Nevada. Great Basin Birds. 10:63-66. Audubon. 2012. County Survey 2012 (Unpublished). Audubon. 2011. Statewide Survey, 2011 (unpublished). Audubon. 1999. Statewide Survey, 1999 (unpublished). Audubon. 1997. Statewide Survey, 1997 (unpublished). Audubon. 1994. Statewide Survey, 1994 (unpublished). Audubon. 1991. Statewide Survey, 1991 (unpublished). Avery, ML, DeHaven RW. 1982. Bird damage to sunflowers in the Sacramento Valley, California.. Tenth Vertebrate Pest Conference (1982). :197-200. Beedy, EC, Hamilton WJ. 1997. Tricolored Blackbird status update and management guidelines..
Beedy, EC, Hayworth A. 1992. Tricolored blackbird nesting failures in the Central Valley of California: general trends or isolated phenomena? Endangered and sensitive species of the San Joaquin Valley, California.. :33-46. Beedy, EC, Sanders SD, Bloom D. 1991. Breeding status, distribution, and habitat associations of the Tricolored Blackbird (Agelaius tricolor) 1859-1989..
Beedy, EC. 1989. Draft habitat suitability index model, Tricolored blackbird (Agelaius tricolor).. Bent, AC. 1958. Life histories of North American blackbirds, orioles, tanagers, and allies..
Bureau of Land Management(BLM), SC. 2003. Updated Animal Sensitive Species List — Updated Draft. Jaramillo, A, Burke P. 1999. New World Blackbirds: The Icterids. CDFG, PRBO. 2003. California Bird Species of Special Concern: Updated Draft List and Solicitation of Input..
Orians, GH, Christman GM. 1968. A Comparative Study of the Behavior of Red-winged, Tricolored, and Yellow-headed Blackbirds..
Collier, G. 1968. Annual cycle and behavioral relationships in the Red-Winged and Tricolored Blackbirds of southern California.. Ph.D.
Orians, GH, Collier G. 1963. Competition and blackbird social systems. Evolution. 17:449-459. Marshall, DB, Hunter MG, Contreras AL. 2003. Birds of Oregon: A General Reference. Cook, L. 1999. Tricolored Blackbird (Agelaius tricolor) conservation plan for southern Sacramento County..
Cook, L. 1996. Nesting adaptations of Tricolored Blackbirds (Agelaius tricolor).. Division of Environmental Studies. M.S. Hamilton, WJ, Cook L, Grey R. 1995. Tricolored blackbird project 1994..
Cooper, JG. 1870. Ornithology of California I..
Crase, FT, DeHaven RW. 1978. Food selection by five sympatric California blackbird species. California Fish & Game. 64:255-267. Crase, FT, DeHaven RW. 1977. Food of nestling tricolored blackbirds.. Condor. 79:265-269. Crase, FT. 1975. Analysis of ricefield test of methiocarb for reducing blackbird damage to ripening rice in the Sacramento Valley, California..
DeHaven, RW, Crase FT, Woronecki PD. 1975. Breeding status of the tricolored blackbird, 1969-1972.. California Fish & Game. 61:166-180. DeHaven, RW. 2000. Breeding Tricolored Blackbirds in the Central Valley, California: A Quarter-Century Perspective..
Skorupa, JP, Hothem RL, DeHaven RW. 1980. Foods of breeding tricolored blackbirds in agricultural areas of Merced County, California.. Condor. 82:465-467..
DeHaven, RW. 1975. Plumages of the tricolored blackbird.. Western Bird Bander. 50:59-61. DeHaven, RW. 1974. Bird damage appraisal methods in some agricultural crops. 6th Vertebrate Pest Conference. DeHaven, RW, Neff JA. 1973. Recoveries and returns of tricolored blackbirds, 1941-1964.. Western Bird Bander. 48:10-11. DeHaven, RW. 1971. Blackbirds and the California Rice Crop. The Rice Journal. :7-14. DeHaven R. W., GCJLFT, E. W. Schafer J. 1971. Methiocarb for repelling blackbirds from ripening rice.. International Rice Commission Newsletter. :25-29.
for Diversity, CB. 2004. Petition to list Tricolored Blackbird under the State and Federal Endangered Species Acts and Request for Emergency Action to Protect the Species..
EDAW. 2005. Statewide Survey, 2005 (unpublished). Green, M, Edson L. 2004. The 2004 Tricolored Blackbird April Survey. Central Valley Bird Club Bulletin. 7(2 and 3):23-31. Emlen, JT. 1941. An experimental analysis of the breeding cycle of the tricolored red-wing.. Condor. 43:209-219..
Evermann, BW. 1919. A colony of tricolored blackbirds.. The Gull. 1:2-3..
no report prepared;the survey coordinator Excel spreadsheet only by EDAW. 2005. Statewide Survey, June 2005 (unpublished). Fish, US, Service. W. 2002. Birds of conservation concern 2002.. Fish, US, Service W. 1995. Migratory nongame birds of management concern in the United States: The 1995 List..
Frayer, WE, Peters DD, Pywell HR. 1989. Wetlands of the California Central Valley: status and trends 1939 to the mid-1980's..
Hamilton, Meese. 2006. Habitat and Population Characteristics of Tricolored Blackbird Colonies in California. California Department of Fish & Game. Hamilton, WJ, Meese RJ. 2005. Habitat and population characteristics of tricolored blackbird colonies in California..
Hamilton, WJ. 2004. Tricolored blackbird management recommendations and 2005 Survey priorities..
Hamilton, IIIWJ. 2000. Tricolored Blackbird 2000 Breeding Season Census and Survey - Observations and Recommendations. Hamilton, WJ. 1998. Tricolored blackbird itinerant breeding in California. Condor. 100:218-226. Harrison, C. 1978. A field guide to the nests, eggs, and nestlings of North American birds..
Hosea, R. 1986. A population census of the tricolored blackbird, Agelaius tricolor (Audubon), in four counties in the northern Central Valley of California.. Department of Biological Sciences. M.S. III, WHJ. 2000. Statewide Survey, 2000 (unpublished). Kennard, JH. 1975. Longevity records of North American birds.. Bird-banding. 46:55-73. Maillard, J. 1914. Notes on a colony of tricolored red-wings.. Condor. 16:204-207. Maillard, J. 1910. The status of the California bi-colored blackbird.. Condor. 12:63-70. McCabe, TT. 1932. Wholesale poison for the red-wings.. Condor. 34:49-50. Meese, RJ. 2007. Settlement, breeding, productivity and color-banding of tricolored blackbirds in 2007 in the Central Valley of California..
Meese, RJ. 2006. Settlement and breeding colony characteristics of tricolored blackbirds in 2006 in the Central Valley of California..
Wahl, TR, Tweit B, Mlodinow SG. 2005. Birds of Washington: Status and Distribution..
Neff, JA. 1942. Migration of the tricolored red-wing in central California.. Condor. 44:45-53. Neff, JA. 1937. Nesting distribution of the tricolored red-wing.. Condor. 39:61-81. Observatory, PRB. 2002. Tricolored blackbird survey report 2001..
Orians, GH. 1963. Notes on fall-hatched tricolored blackbirds. Auk. 80:552-553. Orians, GH. 1961. Social stimulation within blackbird colonies.. Condor. 63:330-337. Orians, GH. 1960. Autumnal breeding in the tricolored blackbird. Auk. 77:379-398. Payne, R. 1969. 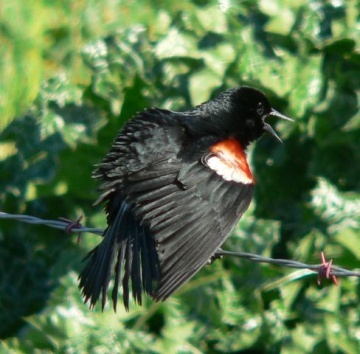 Breeding seasons and reproductive physiology of tricolored blackbirds and red-winged blackbirds.. University of California Publications in Zoology. 90:1-137..
Pyle, P. 1997. Identification guide to North American Birds..
Sloat, T. 2005. South Sacramento Habitat Conservation Plan (2005): Appendix A.
Tyler, J. 1907. A colony of tri-colored blackbirds.. Condor. 9:177-178..